Work began on The Beatles fifth UK album, Help!, on this day. Three songs were recorded over two sessions lasting from 2.30-5.45 and 7-10.30pm. 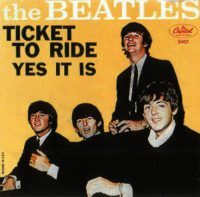 The first song to be recorded was Ticket To Ride, which became The Beatles' first single of the year on 9 April 1965. From this session onwards, The Beatles adopted a new method of recording. Instead of essentially performing their songs live in the studio, they increasingly taped the rhythm tracks first, then overdubbed vocals and extra instruments onto the best takes. Previously, The Beatles' overdubs had been given individual take numbers. From 1965 onwards, however, these additions were unnumbered. As a result, although a song may appear to have been completed in just a handful of takes, it could have required a great many extra recordings before completion. 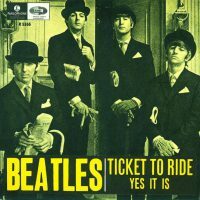 The rhythm track of Ticket To Ride was completed in two takes, the first of which was a false start. 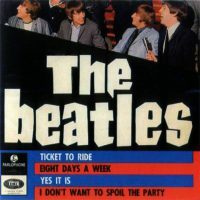 The second featured no vocals, with the four-track take as follows: bass guitar and drums on track one; George Harrison's Rickenbacker 12-string guitar playing the main riff on two, along with John Lennon's Fender Stratocaster and Paul McCartney's Epiphone Casino guitar parts; track three featured Lennon's lead vocals and tambourine; and four contained handclaps, McCartney's backing vocals, and Harrison's Fender Stratocaster guitar. Paul McCartney played both bass and lead guitar on the song, and also reportedly suggested Ringo Starr's distinctive drum pattern. The evening session was devoted to Another Girl and I Need You. The rhythm track for the first of these was captured in one take. 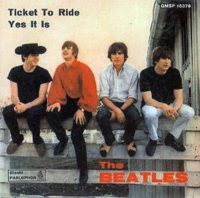 Track one contained McCartney's bass guitar and Starr's drums; track two had Lennon's Fender electric and Harrison's Gibson acoustic guitar; track three contained McCartney's lead vocals, with backing from Harrison and Lennon; and track four had more vocals from Lennon and McCartney, tom-tom from Starr, and Harrison on Gretsch electric guitar. This last overdub was a guitar flourish, recorded 10 takes for the song's ending, to be edited onto the song at a later date. The idea was dropped when the song was mixed for release. The final song, I Need You, took five takes to record. This was Harrison's first song to be recorded since Don't Bother Me. The line-up was unusual, and documented by George Martin in his detailed session notes (originally published in his limited edition book Playback). Harrison played a Spanish guitar and McCartney was on his usual Hofner bass, but Starr created a percussive rhythm on the back of a Gibson Jumbo acoustic guitar. Lennon, meanwhile, played the snare drum on beats two and four throughout the song. The backing was recorded onto track one of the tape. Harrison's guide vocals were recorded at the same time onto track two. More guide vocals, with Harrison joined occasionally by McCartney, were added to track three; and track four contained further vocals from the pair, with cowbell by Starr. Vocals and the distinctive tone pedal guitar were added the following day.